All of these pendants are one-of-a-kind pieces because they incorporate handcut, unusually shaped stones or fossils. Therefore, some may not be available as shown. However, if a particular design appeals to you, a similar piece can be created to your own personal specifications! All pendants include a 16" or 18" Sterling Omega chain. Point to thumbnail to enlarge. 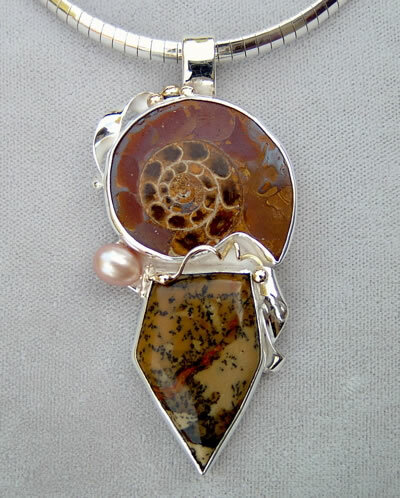 1) Sterling silver pendant with silver ribbon and 14K Gold bead and wire accents, using Ammonite Fossil, Picture Jasper, and freshwater Pearl; approx. 2 3/4'' x 1 1/4".